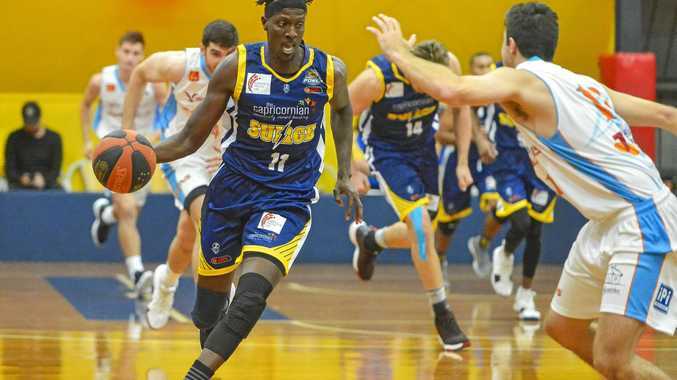 BASKETBALL: Cairns Marlins split its away double-header to a win and a loss after yesterday's 111-85 win over Gladstone Port City Power Breakers at Kev Broome Stadium. The Power were to gun for a fifth win in a row, but were never in it from the get go. Marlins swimmingly went to a 9-0 lead and Gladstone looked for a circuit-breaker to stop the visitors' excellent shooting from outside the key. Despite the best efforts from Taylor Young (28 points) and Tyler Allen with 12, Power coach Brady Walmsley said his team lost focus. "That team's a good team and they've got good players and are well coached," he said. "We knew that they were a team that weren't going to beat themselves." Walmsley also said the Power went away from doing the basic things which got it four wins in a row. He saw positives when Boti Hajos, Dylan Owen and Mitch Knight were introduced for decent minutes in the third quarter. "To our credit I though our second-tier guys put in a really good effort in that third quarter to bring the right energy and we started to play the game on our terms a little bit." Cirkook Riak's double- double of 14 points and 10 rebounds was another positive, but Walmsley will look to iron out any deficiencies during the week. "We all need to be better than that next week and that's got to require a fair bit of practice," Walmsley said.